56. Centaur Warrunner: Centaur Warrunner (known by his dear friends as Bradwarden) is a buff horse man with an axe. It’s fun to be Bradwarden; he can stomp his feet, hit enemies so hard he hurts himself, and can make his team run at max speed, barreling over terrain and enemies alike. He’s also the beefiest hero in the game, which means that few heroes can trade hits with him early on, and it’s nearly impossible to kill a Bradwarden who’s gotten a early lead. 55. Enchantress: Enchantress gets to have the same fun Chen does by controlling neutral monsters around the map, but the best part about her is that she doesn’t rely on them. She can get the same early lead by thrusting the monsters towards the enemy base before opponents can deal with them, but she also evolves into a powerful creature on her own, using her Impetus attacks to deal damage based on how far her attacks fly. She also has a ridiculous amount of durability, with a powerful heal and an ability which her enemies’ attacks down to a crawl. 54. Puck : Puck is one of the most fun heroes to watch in Dota 2. His skillset allows for some highly-demanding, highly-rewarding play, and there’s a reason one of the professional scene’s most exciting moments is named after one of his abilities. Unfortunately, the game’s outgrown him; he’s rarely picked anymore, even in regular matchmaking games, largely because many of the heroes who do what Puck does more easily have gotten stronger, while Puck has remained largely stagnant. 53. Abaddon: Though he’s not as easy to use as, say, Lion or Omniknight, Abbadon is a support you can have just about anyone play without losing you the game. All of his abilities synergize in such a way that he can keep teams alive long past their expiration date, and he doesn’t sacrifice his own safety for it, either; when he dips below a certain amount of health, he’ll turn any damage he takes into the health, which goes well with his health-draining Mist Coil ability. He’s hard to kill and makes others harder to kill—a tough combination to deal with without the proper coordination. 52. Doom: Doom is the devil. He means business, and he can cast a powerful pentagram that prevents you from casting spells, using items, or doing anything that isn’t running away or attacking, really. It’s a spell so strong Doom named himself after it. He can also eat monsters and take on their abilities, which gives him some utility at every stage of the game. No one hero can really counter Doom, and must instead buy items which can diminish his usefulness on the battlefield. He might be a bit of a one-note character, but it’s a powerful note to rely on. 51. Juggernaut: Juggernaut mixes a few aspects of Dota 2 in ways that make him both accessible to newcomers and fun for veterans to play. His abilities let him get out of tough situations, heal himself without having to return to base, give you a powerful slashing attack I can only describe as “very anime,” and some great scaling throughout the game. He’s not the best hero by any means, but he’s got something for just about any kind of player, which makes him an easy choice for players looking to start and not play paper-thin support heroes. 50. 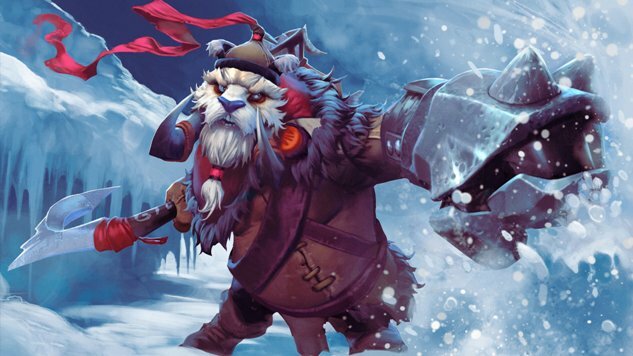 Ursa: Ulfsaar, also known as the Ursa Warrior (also known as just Ursa, or “Fuzzy Wuzzy,” a moniker I swear I did not make up) is another hero who, like Slardar and Centaur Warrunner, relies on items to close the gap between him and his foes. What makes Ursa a favorite for many players, however, is his Overpower and Fury Swipes abilities, which let him shred most enemies in seconds, doing more damage with each successive hit. This also makes him one of the few heroes who can singlehandedly defeat the most powerful enemy on the map, Roshan, before the ten-minute mark. When playing against an Ursa, always keep an eye on the Roshan pit—you never know when you’ll see him try to sneak in a kill. 49. Enigma: The Black Hole defines Enigma like a bad relationship. It’s an incredibly useful spell which, with the right setup, can lock entire teams into positions long enough to win fights single-handedly. But it has one of the longest downtimes in the game, and without it, it’s hard for Enigma to do much in fights. A good Black Hole will save you, make you the envy of players everywhere; a bad one, like missing five enemy heroes who were in plain sight, will ruin you. There’s more to him than that, (he can spawn cute little copies of himself), but most players pick him so they can land Black Holes and feel cool. 48. Medusa: Medusa defies the common archetype of “women in competitive games” simply by sticking closely to the Greek myths that inspired her. She was once beautiful and all that, and then turned into a monster. But she’s much stronger for it, becoming one of the hardest-to-kill heroes in the game in due time. Few other heroes can outfight her, and she take a beating thanks to her Mana Shield, further spitting in the face of women trending towards low-health, high-damage roles. 47. Tusk: Tusk's a fun hero to just look at. He’s one of Dota 2's silliest champions, speaking in a thick Swedish (I think?) accent and running around with a giant boxing glove and icicle. He can turn into a giant snowball and uppercut enemies, launching them towards the screen. The funniest thing is that not only is it ridiculous to do, it’s also one of the most effective skills in the game at locking down a single target. He’s a big lovable oaf, something Dota 2 doesn’t have enough of. 46. Storm Spirit: Storm Spirit is one of the few heroes who seems happy to be playing Dota. He doesn’t brood, make remarks about how he’s going to defeat someone, take revenge, or accomplish a higher goal; he just wants to do his thing, which is zip around the map as a ball of lightning, appearing suddenly and killing enemy hero before they have a chance to react. He’s another hero who top players love to show off on, but at least with Storm Spirit it’s fun to watch them do it. 45. Broodmother: Broodmother is a combination of three things many people don’t like: split pushers (who avoid fights in favor of destroying base defenses on the sly), invisible heroes (which no one likes to play against), and spiders. And if you don’t like people who play Dota 2, you pick Broodmother. She bullies just about any opponent in lane if they’re not equipped to see her, and can destroy towers quickly if left alone. She’s frustrating to fight against, but you have to hand it to a good Broodmother player—they’re fun to watch. 44. Earthshaker: Earthshaker is another hero for newer players who can make contributing to the team as fun as it is easy. He has a powerful ultimate ability with a long cooldown, but he doesn’t rely on it; instead, he can keep people in place for longer than most single heroes can, by using his enormous fissure to block off parts of the map, then slamming his totem down to lock down opponents even longer. He’s got an entire team’s worth of lockdown on his own, which lets him fight into just about any lineup. 43. Templar Assassin: Templar Assassin is in a strange place. She can dominate the middle lane against most other heroes but doesn’t do that well against the best of them. She has a low health pool but can survive ambushes thanks to her Refraction shield. Her ultimate doesn’t deal any damage but is one of the most useful in the game, giving you sight of important areas and slowing down enemies when they’re close by. She’s a character full of subtleties, which is fitting for someone obsessed with keeping secrets. 42. Night Stalker: Night Stalker is one of the most unique heroes in Dota 2. Keeping with his theme of being a vampire, he gains extra mobility and damage output at night (which occurs every four minutes), and his spells get stronger too. His ultimate ability lets him turn day into night on a whim, while also reducing the enemy’s field of vision. Night Stalker takes advantage of an aspect of the game (the day/night cycle) few others heroes do, and as a result he’s a testament to just how far Dota 2 stretches its boundaries for the sake of variety. 41. Tiny: Tiny is actually rather large, which I’m sure none of you saw coming. Actually, he starts off small, then grows bigger with each point put into his ultimate ability. You can also upgrade this ability further, so that rather than punching people with his gigantic arm, he swings a tree around, extending his range dealing damage to multiple enemies at once. There’s a lot to like about Tiny, and his ironic name is just the start. 40. Anti-Mage Anti-Mage needs to lighten up. He hates magic, and has spells and attacks which punish people who rely on their spells to deal their damage. He can drain their mana reserves with his Mana Void, dealing damage based on how much mana the enemy is missing. He has a teleport, which makes him hard to catch and easy for him to amass gold from far away, and he’s a hero who can take down just about anyone once he farms more gold than them. I just wish he would calm down about his whole magic thing. 39. Tidehunter: The common joke about Tidehunter is that he looks like a giant, sentient watermelon. That’s kind of true, but I feel like it sells his aesthetic design a bit short. He carries around a fish and anchor, and you can swap those out for a ton of other silly items. Tidehunter’s design is elegant, simple, and effective, communicating that he is a beefy monster who’s tough to kill and will use water-related spells to kill you. Ravage is a powerful skill, I suppose, but I’d much rather talk about how much I like Tidehunter’s design. 38. Skywrath Mage: Skywrath mage is on quest to find and restore to life his lover, Vengeful Spirit (who is a much better Dota 2 heroine and whom we’ll discuss later), and he also needs to lighten up a bit. He’s one of the most damaging heroes in the early game, firing Arcane Bolts left and right and setting up kills with his Ancient Seal, which amplifies magical damage. He unfortunately falls off in the later game, but he’s never completely useless, as he’s good at decimating low-health heroes before they can do anything about it. 37. Huskar: Playing Huskar feels like driving a sportscar at top speed. You have to take risks constantly just to stay alive, swerving in and out of combat. The less health he has, the more damage he does, and the less damage magic-based attacks do to him. But a single right click can kill him when he’s at his strongest, which makes him a hard hero to manage. He’s an incredibly powerful hero in the right hands, but also highly situational, as certain heroes make short work of him before he has a chance to shine. But for a few glorious seconds, he gets to deal absurd amounts of damage, often taking one or two heroes with him when he dies. 36. Troll Warlord: Troll warlord attacks fast. He moves fast. He can attack at both short and long distance. He’s got one of the most versatile skillsets in the game, and paired with the right heroes, he can be absolutely game-breaking, as his ultimate ability lets everyone else attack as quickly as he does. If he gains an early upper hand, playing Troll Warlord can feel like picking a direction and letting him loose on the enemy team, as he bashes the enemy and destroys them in seconds in a feverish rage. 35. Bristleback : Rigwarl the Bristleback has some of the most abrasive dialogue in the game, with a thick English accent and a tendency to snarl. He has two spells he can spam every few seconds, a quill spray attack and a loogie he can hock from afar, which slows down enemies and lowers their armor. He’s also a hard hero to chase down, as attacks hitting him from behind deal less damage and cause him to unleash more quills. If the enemy isn’t careful, Rigwarl can claim kills without having to do anything but run away from the enemy, as he chips down their health while taking little damage in return. 34. Io: Io is a big ball of light. He’s one of the most support-oriented heroes in the game, since most of his abilities involve latching himself to another person and healing them, increase their attack speed, or teleporting with them anywhere on the map. Io is there to make other heroes stronger, not take the glory for itself. Io makes possible some incredible moments, but only when paired with the right hero. Still, his skillset is so powerful that he’s been around the competitive scene in one form or another since competitive Dota was a thing, and you have to give the little guy credit for sticking it out for so long. 33. Zeus: Another hero for beginners, Zeus can dish out a ton of damage in a short amount of time. He casts lightning bolts every few seconds, and every spell he casts deals bonus damage to enemies around them whether they were hit by the spell or not. His ultimate ability casts lightning on every enemy hero on the map, no matter where they are. This is such a useful skill that whenever someone escapes an ambush with a sliver of health, someone will inevitably type “Zeus ult!” into chat, hoping that by some miracle he’ll enter a match out of nowhere to finish the job. 32. Bloodseeker: No one outruns a Bloodseeker. He can smell blood. The more health the enemy team is missing, the faster he moves, which means in the heat of huge teamfights, he starts moving at impossible speeds, taking potshots at foes than backing away instantly, out of range of retaliation. He can also force opponents to stand still with his Rupture ability, which has them take damage whenever they move. There’s nothing more fun that moving at ridiculous speeds to kill opponents who think they’ve gotten away, and Bloodseeker offers you plenty of that. 31. Nyx Assassin: Of all the heroes with a skill that turns them invisible, Nyx is my favorite. He moves faster when cloaked, and specializes in surprising enemies and killing them from out of nowhere. He used to be a one-note hero, but recent patches have made him much more useful in prolonged fights, as he can now burrow underground and cast more powerful versions of his spells with impunity. 30. Alchemist: Alchemist is a fun guy. Well, he’s actually two: an angry, chemically enhanced ogre and the mad scientist riding him. This leads to a lot of great dialogue, but that’s not the only reason to play as Alchemist: he’s an extremely versatile hero, capable of doing well in just about any lane or role. He can support other heroes, be greedy and buy expensive items before anyone else (since Alchemists turn lead to gold, after all). He’s also the only hero who can buy an item and give it to someone else (only the magical Aghanim’s Scepter, however), which means that after he’s done buying all his items, he can start buying items for all of his friends, too. How nice! 29. Tinker" I could watch someone play Tinker all day. No hero in Dota 2 needs an item to really succeed as much as Tinker needs the Boots of Travel, which let him return to base after a short time. Combined with his ability to reset the cooldowns of all of his items and abilities, this means he can hop around the map in seconds, creating little armies of robots and firing his missiles and lasers multiple times in a single encounter. You click more often and tap more keys when you play as Tinker than as any other hero, and that’s saying something. Start with Part 1 and Part 2, if you haven’t already read them.